Using a by now impressive list of horeca businesses, a number of criteria (listed after many hours of debating) and an anonymous site visit of the proposed businesses, we – the Lambikstoempers vzw – awarded our 9th Gouden Lambikstoemper to a business that – according to us – payed a lot of attention to the Lambic beers in 2018 on Sunday 25 November 2018. And this year the winner is Den Herberg (Octave de Kerchove d’Exaerdestraat 16 at 1501 Buizingen), because of their very attractive offer of Lambic beers (Oude Geuze, Oude Kriek …), but also the Lambic itself, even home made! The Oude Lambik Den Herberg is – if you would ask us – a real gem. The rest of the top 3 in our ranking this year are … second place: De Kluis at Buizingen, where you can always go for a good glass of Oude Geuze or Oude Kriek, or Lambic. 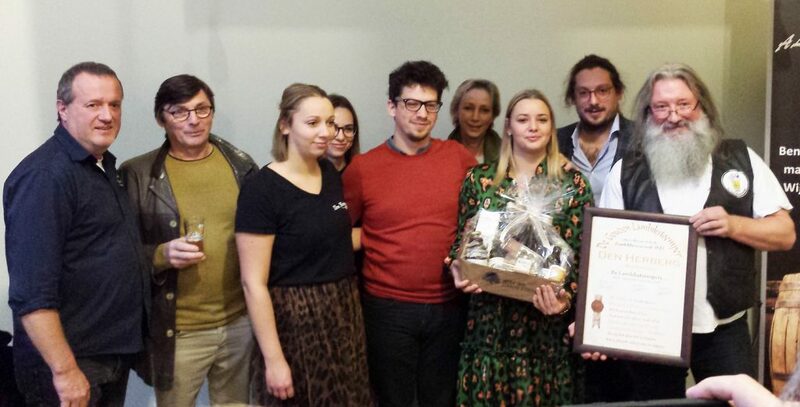 Third place: Spontane Goesting at Itterbeek, started since the spring of 2018 and brought back to life by its new owner David Fleurus (after café “In de Linde” closed its doors). Spontane Goesting has an impressive number of 23 draught beers and – more important – an almost complete offer of Oude Geuze, Oude Kriek and “platte” Lambic. Finally our honorable mention this year goes to the Danish pub Koelschip at Kopenhagen. Because yes, even in Scandinavia they are running wild for our sponateous fermented beers. And Koelschip helps bringing out the message! Who will win our Gouden Lambikstoemper next year? You can contribute to that! How? By sending your favourite for the Gouden Lambikstoemper 2019 through our website. And yes, you can do this even at this moment! 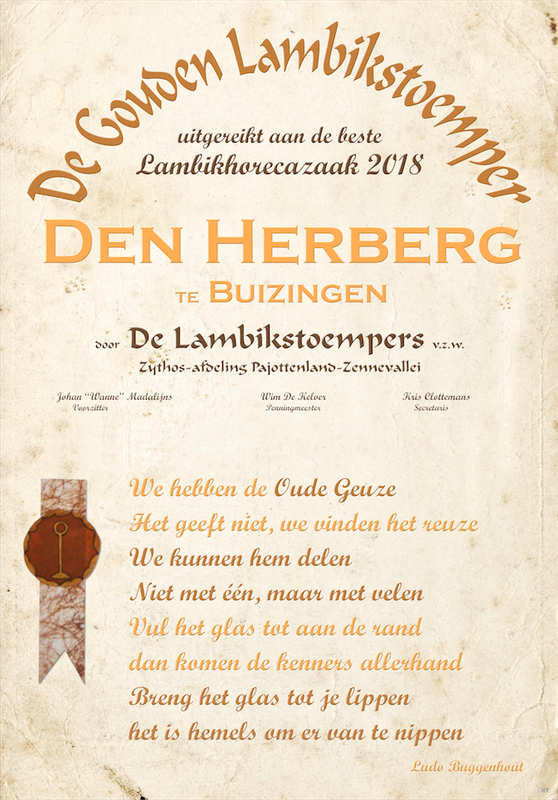 The Gouden Lambikstoemper is an artfull certificate with a poem by the hand of Ludo Buggenhout. Look at our list of all preveous winners! How do we each year gather the nominations and elect the final winner of our Gouden Lambikstoemper? It is based on a by now impressive list of Labic cafés and horeca businesses that pay special attention to our Pajottenland ‘s pride of spontaneous fermentation. And yes, this list is on-line, at your disposal! Even more: if you yourself have any suggestions to complete our list, you can send them at redactie@lambikstoempers.be. We try to add your suggestions as soon as possible, of course after controling their offer of spontaneous fermented beers. This way who knows you can determine the winner of our Gouden Lambikstoemper 2019, which is traditionally awarded at our Day of the Oude Geuze at Streekproducten Centrum in Halle. beer, Den Herberg, Golden Lambikstoemper permalink.